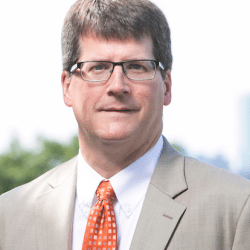 Eric Johnson is Senior Vice President for University Advancement, overseeing the university’s fundraising, alumni relations, advancement administration, and donor relations across Tufts’ undergraduate colleges as well as its graduate and professional schools. Prior to his appointment in this role, he served as executive director of development, in addition to acting as principal-gift officer, working with the president and other senior leaders on leadership gifts to the university. He played a key leadership role during Tufts recently completed $1.2 billion Beyond Boundaries campaign. Johnson has 32 years of fundraising experience, 28 of them at Tufts, where he began his career as a major-gift officer in the School of Arts and Sciences. He has worked as director of development for the School of Arts and Sciences, deputy director of development for the university, and director of principal and leadership gifts. Johnson helped develop the President’s Marathon Challenge in 2003, the year he ran his first marathon. Since then, he has stayed active in the program and has run 42 marathons to date. Johnson’s parents are both Tufts alumni from the class of 1954. Eric holds a B.A. in political science from George Washington University.